A profile of Kathini and Larry, written as they prepare to set sail for Vancouver, can only be a tribute, one contributed to by colleagues and students who worked closely with them. They have both given so much to the community that it’s hard to know where to start. 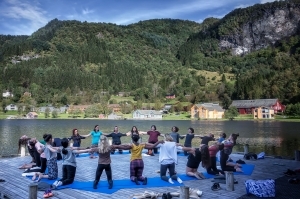 Kathini taught yoga – with gusto – to countless students, staff and local enthusiasts. The support she gave through her classes, the listening ears many found as a result of this contact – these were gifts offered up from a warm and generous heart. If someone was struggling, Kathini was there to guide and encourage, suggesting alternative approaches for the body and mind to consider. Her belief in the nourishing power of the practice and her commitment to her students helped many through dark times – both the literal (November) and the figurative (IB stress!). She expanded as a teacher, slowing it down, going deeper, while enjoying the playfulness, the hysterical giggles that sometimes resulted from her yogis’ efforts. A natural extension of the work Kathini did with the students “on the mat” was the energy she invested in designing the RCN’s Safety Net with dedicated colleagues, striving to make sure all learn to not only cope with the vicissitudes of life, but actively thrive. Kathini’s passion for yoga was matched by her desire to create beautiful spaces where magic can unfold. She dedicated herself to decorating and in some cases reinventing the dayrooms and staffroom, giving them a much needed face-lift, thinking carefully and creatively to maximize potential despite dimensional limits. Celebration dinners, council gatherings and other notable events had fresh, vibrant life breathed into them. Guests felt that something exceptional had been arranged by someone who cared. Kathini and the team of student event planners she trained made every event they waved their magic wands over special, memorable. Kathini and Larry opened their hearts and their home to countless students, staff and visitors over the years. As one colleague fondly put it, “There was always another seat at the table, always room for one more.” And the “table”, their home, was rarely empty of guests. 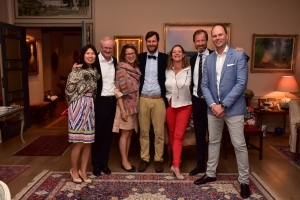 There were regular pizza evenings with students, Norwegian lessons for staff with fresh bread and hummus, dinners for board members and other official visitors, staff gatherings. And there were other visitors not found on any official programme. Many in distress knocked on their door at all hours and were heard and comforted, their guest room was seldom empty, their family time often interrupted by the unanticipated caller, never turned away. In one of the year-end RCN traditions students and leaving staff gather at the dock and leap into the cold waters of the fjord. It’s a rite of passage, and this year Larry was among the leapers, taking the plunge with an artfully placed UWC Red Cross Nordic tattoo inked across his back. The tattoo was temporary, but in many ways Larry has been stamped with an indelible tattoo for 6 years, committing himself to the College community, its moods, challenges, needs and potential with extraordinary energy and dedication. It is no secret that Larry is a fan of alliteration. 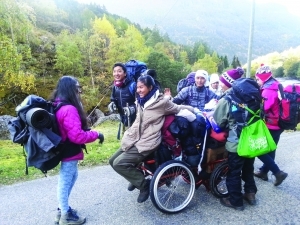 His oft-repeated calls for connection, compassion, conversation, companionship and kindness echoed in the ears of each generation of students he has welcomed. He aimed high, getting to know the students, paying attention to what they did and said, acknowledging contributions of all sizes made by members of the community. He showed that he cared. He wanted to know. And he thanked, often on postcards in his indecipherable script, demonstrating that he saw, he appreciated; the details mattered. Larry’s attention to detail, his unflinching commitment to excellence, ran through every speech he gave, every university testimonial that crossed his desk (and they were all carefully read not just for content, but for linguistic accuracy), every document he produced and every task he undertook. An incredible list-maker who not only saw the bigger picture but meticulously drew out the finer details, when it came to work ethic he set an impossibly high standard – and held himself to it. One colleague observed that he had never seen anyone work harder. Larry has a knack for recognizing and fostering potential in the people around him. He believed in and has taken chances on people – staff and students – and the risks he took usually proved well-founded. Early on he saw the potential of Board and Council members, inviting them to offer workshops and engage with community members in their daily lives at the College rather than merely parachuting in for meetings. Recognising that the duty of care we have for the students had unrealized potential, too, he built up staff competence through workshops with visiting experts, channeled prodigious energy into creating much improved pastoral care systems, and found endless ways to enhance the experience of students who stayed on campus during short breaks. He insisted that winter be lightened up, both literally and figuratively, and in so many unrecognised ways he sought to ensure that students were adequately supported and nourished, academically, socially, emotionally. He also fought hard to get and keep students from spectacularly diverse backgrounds. 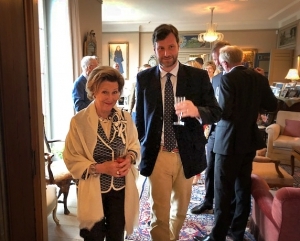 Under his leadership the Survivors of Conflict and Foundation Programmes became realities, and his unwavering support for projects with local asylum seekers and recently settled immigrants made it possible for the school to arrange a wide variety of joint ventures on our campus. As individuals and as a team Larry and Kathini have made a difference. The College has changed, in many ways becoming a kinder, more caring place where mistakes are forgiven, potential is nurtured, those in struggle are seen and heard, and the quality of daily interactions, daily happenings, the small stuff, matters a little bit more. 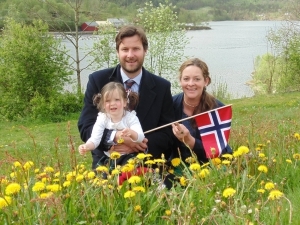 Beyond the major contributions that they made to the RCN community, there are many significant details whose memories, we hope, will bring a smile to their lips in the years to come: playing Santa; hiding Easter eggs in the wee hours of the morning for the students; fishing with local enthusiasts, young and old; embracing many Norwegian traditions on their wedding day; learning to cross-country ski; taking yoga to the fjordside; seeing that change is possible, that some risks are definitely worth taking. 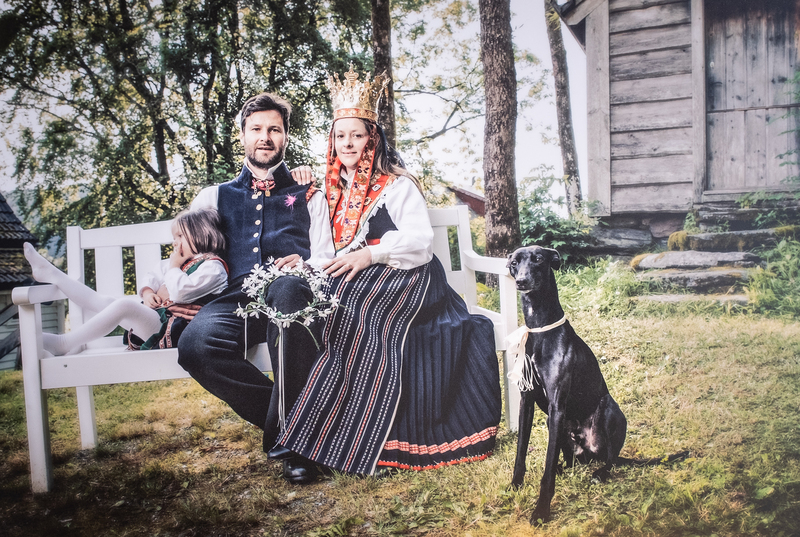 Main photo by David Zadig – with thanks. 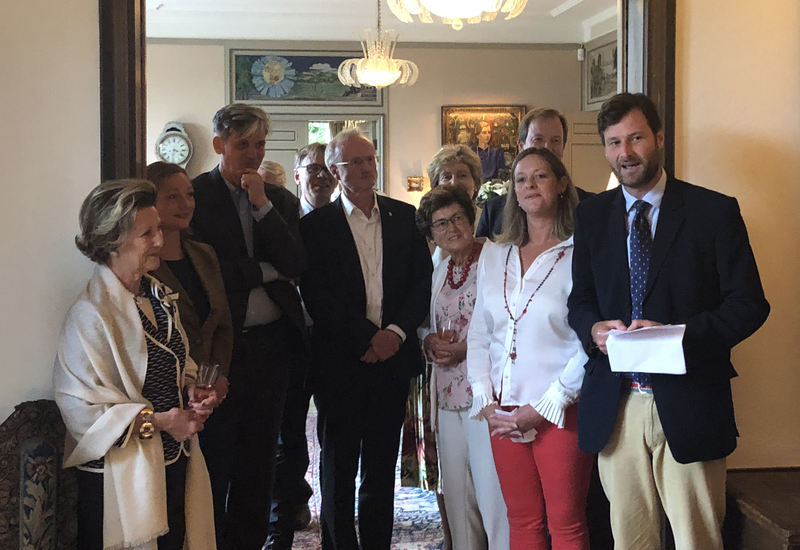 Marianne Andresen hosted a farewell reception for Rektor Richard Lamont and his wife Kathini Cameron on Monday evening. 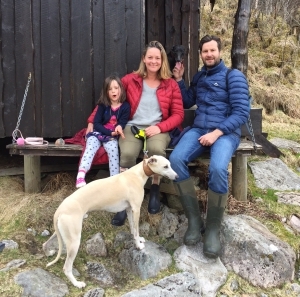 This was an opportunity for the many close contacts Larry has made in Norway to say “au revoir” – we will meet again, as he is moving on to a new post from the next school year. 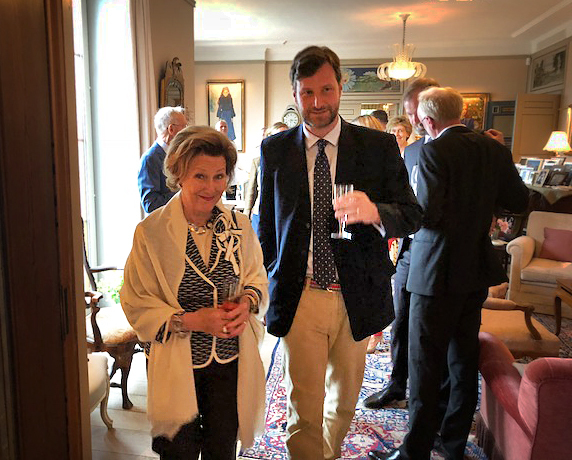 It was a great honour that Her Majesty Queen Sonja came to give her best wishes for the occasion. 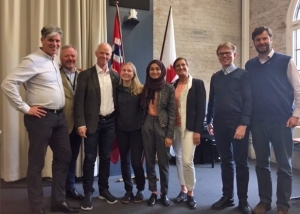 Formal greetings were given by Pär Stenbäck, Kristin Vinje, Arne Osland, Sven Mollekleiv, Pål Brynsrud, Jens Waltermann and Elizabeth Sellevold all on behalf of their constituencies. 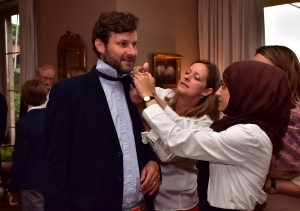 The Rektor is given a hand-made bow tie by Mawra from the Red Cross. Purposeful diversity is the key to UWC education and is a guiding principle for selection to RCN. We strongly believe that bringing together young persons from different backgrounds – cultural, political and social – for a shared educational experience is mutually beneficial to all, given that we create arenas where all take part on the same terms. Our aim for the students is that they shall learn and grow in all fields during their time here; be it in the residential, academic or extra-academic areas. The Foundation Year is a tailor-made course focused on English language development, study skills, and foundation in Maths, Science, Humanities and IT – alongside a holistic approach as expressed in the UWC Educational Model through extra-curricular challenges and our residential programme, emphasizing trust and a sense of belonging. 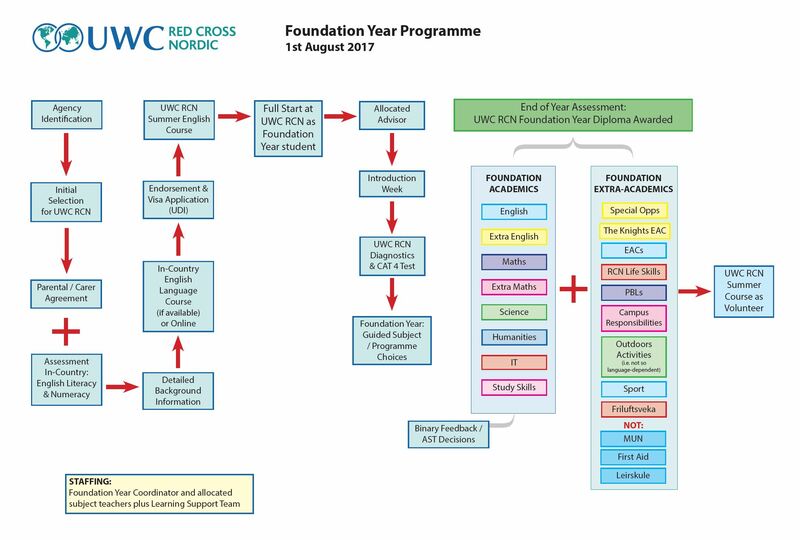 The participants will take our UWC Red Cross Nordic Foundation Diploma – and this will be awarded at the end of the course. The main aims are to build confidence, nurture participation in our deliberately diverse student community, and prepare students for the demands of the two year IB Diploma or course certificates. Each student will be given a tailor-made timetable and individual tuition with more appropriate challenges, organised / supervised by the Learning Support Team. Our human environment of purposeful diversity becomes a resource for all when each and everyone is equipped to learn, progress and share. 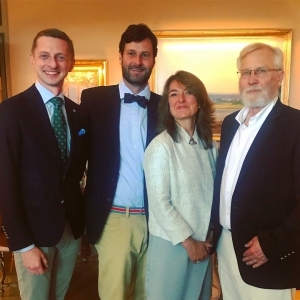 Thanks to the Høegh Foundation and the Davis-UWC IMPACT Challenge for enabling us to set up the support infrastructure through our 20th Anniversary campaign in 2015 – and to Zoya Taylor and Harald Møller for their generous donation to the programme in 2017. The Foundation Year is a crucial component for our purposely diverse recruitment. 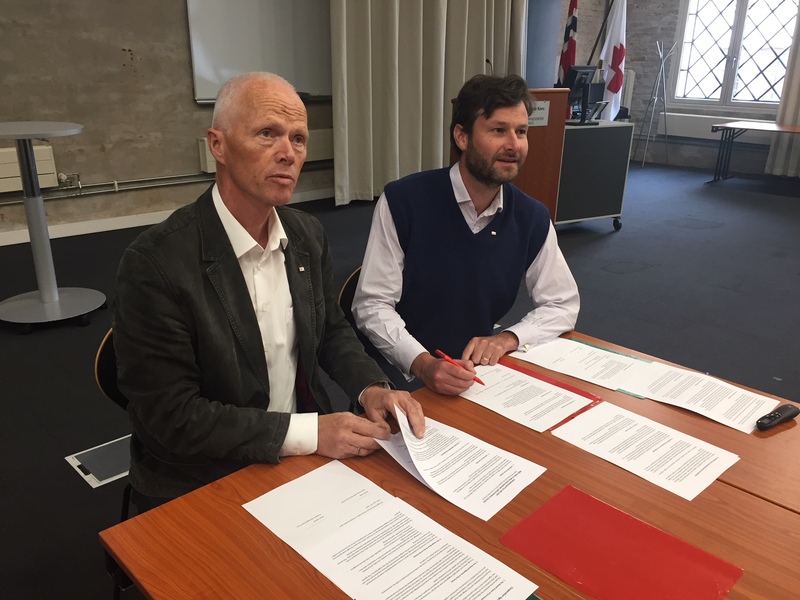 Today Robert Mood, the President of the Norwegian Red Cross, and our Rektor Richard Lamont signed a new version of our cooperation agreement, following a shared evaluation process. The agreement lays the foundation for continued close cooperation on humanitarian issues and ensures that Red Cross principles and skills have a central place in the education we provide. The signing took place at the Red Cross Conference Centre in Hausmanns gate.